Invited to contribute to the Groundwork programme, David Paton devised a field trip focused on granite. 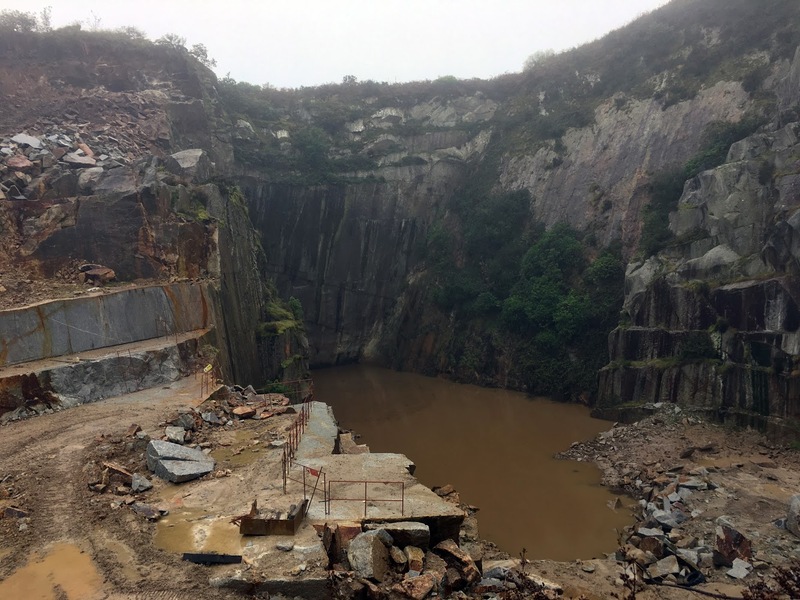 Tracing Granite: In Search of a White Cross took its participants on a tour of granite quarries in the far south west of England. Intended to bring the quarries and participants into conversation, the trip engaged different sites of knowledge, practices and passions. 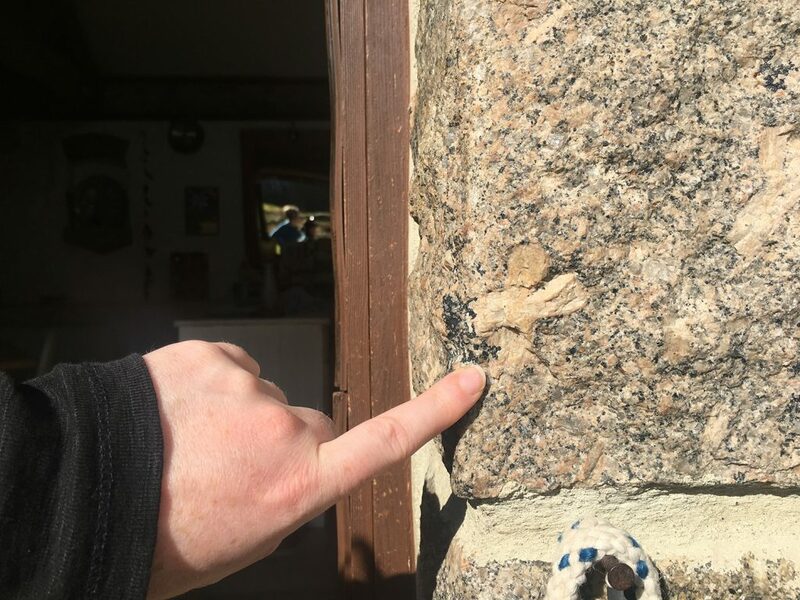 It involved geologists, artists, writers, social historians and cultural geographers, who, over the course of four days, also met with people on the ground who had connections – past and present – with the granite-working industry. Underpinning all of this was David Paton’s preoccupation with the idea of ‘entanglement’ – a concept in recent philosophy that comes from quantum physics – which emphasises the inter-connectedness of things, animate and inanimate, human and animal. It was this that informed David’s multi-faceted approach to the trip, with its range of participants, meetings and venues. David’s contribution to this archive takes the form of a brief essay describing the geology of granite, and two glossaries, which draw upon his connections with geologists and his stone-working expertise. The geology of Cornwall and Devon consists primarily of granites, sandstones and slates. Over millennia, episodes of extreme compression, submersion, heat and erosion have exposed the granites that now provide many of the visually distinctive features in this part of the country. Notable examples are the famous Cheesewring on Bodmin Moor and the rugged coastal cliffs extending around West Penwith, which form the farthest south west district of mainland Britain. The six main intrusions (also called plutons) of granite in south west England are, from west to east, the Isles of Scilly and Land’s End, Tregonning and Godolphin, Carnmenellis, St Austell, Bodmin and then Dartmoor. They are identified with a single structure called the Cornubian Batholith that extends approximately 250km in a roughly east to west direction and 50km north to south. The granite intrusions were formed between 300 million and 270 million years ago. The 300 to 400 million-year-old sedimentary rocks that capped the granite intrusions have since been eroded over hundreds of millions of years, through to the end of the last glaciation eleven thousand years ago, eventually revealing these granite outcrops. Thus, the formation of the landscape of Devon and Cornwall, and the accessibility of the granite for quarrying and ore extraction, is the result of incredible geological processes across immense stretches of time. Granite is a coarse-grained igneous rock (formed from a melt) composed mainly of the minerals quartz, plagioclase feldspar, alkali feldspar and one or more dark micas. The feldspars found in most Cornish granites form distinctive patterns and are usually noticeably larger within the overall crystalline structure; they are mostly creamy-white or light grey, although some are pink, and can be anything from a small pea-sized form to a large thumb-sized oblong or palm-shaped chunk. Cornwall has some highly unusual granites too, such as the unique altered granite, rich in tourmaline, called Luxullianite. It has stunning salmon-pink feldspars in a mainly black surround and is only found in the St Austell area; it was famously used for the Duke of Wellington’s tomb in St Paul’s Cathedral. The minerals veined within the granites have provided much of the wealth for the south west of England region since the seventeenth century, with metal ore extraction and trading supposedly dating back three thousand years. Tin and copper mining was once Cornwall’s primary industrial activity, but, since being exposed to competition by the expansion of mineral extraction around the world in the twentieth century, it has largely ceased. South Crofty, the last Cornish tin mine, closed in 1998. The dimension granite industry (quarrying for architectural block) in Cornwall and Devon reached its most productive period between the late-nineteenth and early- twentieth centuries. Penryn, near Falmouth in Cornwall, was once home to a substantial masonry yard that processed granites from many of the Cornish quarries during the heyday of granite production. It was the centre of operation for John Freeman and McLeod Ltd, a name that is still mentioned with fondness by residents and masons today. This regionally influential company finally closed in 1965, after decades of high-profile granite processing and exportation. 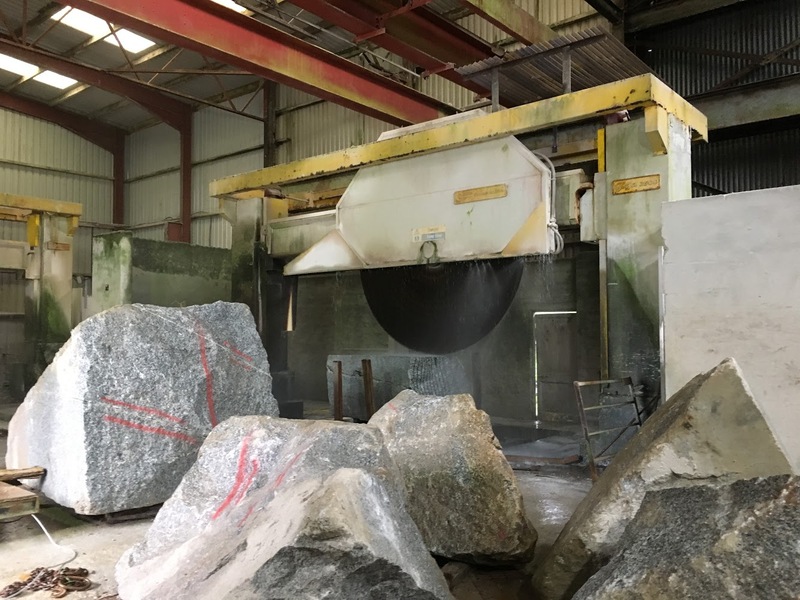 The working of granite began to have a significant impact on the landscape after the 1800s; before then, granite production mainly utilised the loose and exposed boulders on the surface. More sophisticated technologies for extracting and splitting granite advanced during the early nineteenth century, moving from methods such as ‘wedge and groove’ splitting to drilling holes by hand with tools such as a ‘swell jumper’ and using ‘plugs and feathers’, then explosives (‘black powder’ – charcoal, salpetre and sulphur) and on to pneumatic tools and large saws that were introduced during the mid-twentieth century. At this point, Cornwall and parts of Dartmoor in Devon were dotted with many large quarries, along with hundreds of small pits close to villages and on large estates. Each large quarry would have its own blacksmith and a range of highly skilled quarry workers, along with a more transient, less skilled, labour force. As the twentieth century progressed, developments in concrete, along with competition from northern European granite producers, especially from Norway, undermined the demand for south west England’s granite in major construction projects. 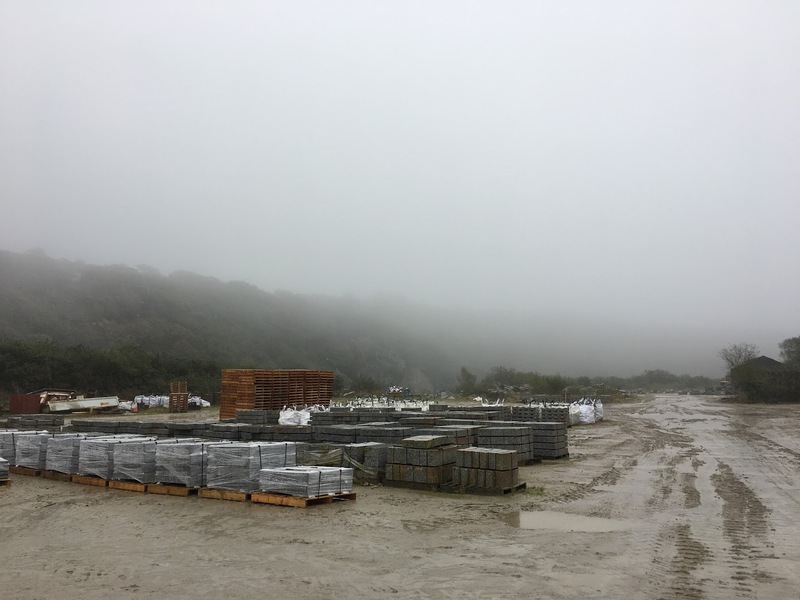 By the 1980s the number of large quarries had fallen to just a handful, and down to just two in 2018. A history of working granite on an industrial scale, which began five thousand five hundred years ago with the fashioning of exposed moor stones for tombs and menhirs, had all but disappeared by the turn of the millennium. The following glossaries offer explanations of key terms associated with granite. The first, compiled by geologist Dr Beth Simons, provides a geological lexicon; the second, compiled by David Paton, a vocabulary associated with granite quarry-workers. Aplite – an igneous rock with the same composition as granite, but one that has very fine-grained crystals, making it look ‘sugary’. It often occurs in association with pegmatite or in veins cross-cutting a granite. Batholith – a word used to describe a large irregular mass (or masses) of an intrusive igneous rock, like a granite. Cairn – not strictly granite-related, but is a common feature on the granite moors – designating a human-made pile of stones that have been present in the landscape since the early Middle Ages. Cordierite – a mineral containing magnesium, iron, aluminium, silicon and oxygen. It is common in metamorphic rocks, but is also present in the younger granites of England. Under the microscope it has a distinctive hexagonal pattern. Cornubian – a word used to describe the granite body of the south west of England, collectively termed the Cornubian Batholith. Elvan – an igneous rock with large quartz and/or alkali feldspars in a fine-grained mix of quartz, feldspar and mica. Usually when an elvan is found, there’s a mineral lode nearby. Enclave – rounded volumes of rock surrounded by another rock; both have distinctively different compositions and were formed in different ways. In the South West, the younger granites enclose rounded blobs of dark basaltic enclaves. Granite – the best rock type! A coarse-grained igneous rock (formed from a melt) composed mainly of the minerals quartz, plagioclase feldspar, alkali feldspar and one or more dark minerals. Can be grey, white, pink, yellow or brown. Greisen – a light-coloured rock containing quartz, mica and topaz formed as hot fluids emanating from a granite magma alter the granite. Classic exposures of this are found at Cligga and St. Michael’s Mount. Lithophile – a term used to describe elements in the periodic table that are rock-loving. Most of the lithophiles are associated with peraluminous granites – lithium, beryllium, fluorine, rubidium, tungsten, tantalum, niobium. Luxullianite – a rock formed from the alteration of a granite by boron-rich fluids. Consists of pink alkali feldspars and needles of tourmaline. Its name is derived from the area around Luxulyan near St Austell in Cornwall. Muscovite – a mineral from the mica group containing potassium, aluminium, silica, oxygen, minor iron and water. It is pale golden to silver and forms shiny flakes within the granite. It is the shiny mineral that sticks to you on beaches such as Porthcurno in West Penwith. Pegmatite – a very coarse-grained granite, with crystals that can reach 20cm. Most pegmatites have quartz, feldspar and mica. It is common along the tops of granite intrusions. Peraluminous – there are three main types of granite – peraluminous, metaluminous and peralkaline. The Cornubian Batholith is peraluminous, which means it has more aluminium than calcium, potassium and sodium combined. Phenocryst – a relatively large and noticeable crystal within a finer grained rock. In the south west of England, the large white, alkali, feldspar phenocrysts are obvious in the Land’s End, St. Austell and Dartmoor granites. They sometimes make crosses! Porphyritic – an adjective used to describe igneous rocks that have a distinct difference in the size of the crystals, like the granites from Land’s End, St. Austell and Dartmoor. Porphyritic granites are the most likely substances to yield a white cross. Tor – not exclusive to granites, describing a craggy outcrop of rock on the summit of a hill. Almost exclusively used in the south west of England, however, to describe a granite hill. Tourmaline – a mineral that contains boron, as well as silicon, aluminium, iron, magnesium, sodium, fluorine and sodium, amongst others. It comes in a variety of colours, including special ‘watermelon’ pink-green varieties. The amount of boron in the granites found in the south west of England is high, and slightly unusual, so many people come to Cornwall to collect the tourmalines. Variscan – a mountain-building event, called the Variscan Orogeny occurred when two tectonic micro-plates collided approximately 380 to 280 million years ago. This is when and how the granites in Cornwall formed. Other granites that also formed during this event stretch across western Europe. Zinnwaldite – a golden lithium-bearing mica mineral. It is an important component in some of the tourmaline and topaz granites in the south west of England. It is no longer the official name for the mineral, if commonly used by geologists. Arris – a general stone masonry term for a sharp or defined edge at the intersection of two surfaces. Banker – a stable structure on which to place the granite block ready for working. At Trenoweth they use huge timbers recovered from Falmouth docks. Bug – a small black blob (enclave) that is particularly despised in the memorial trade, as it ruins the fine pattern of the finished and primed surface made ready for lettering. Bullied – a particular finish on ashlar or quoins (structural building blocks on corners and fenestration) whereby the middle of the worked surface is higher and rougher than the outside edge, sometimes featuring a neat chiselled frame to each worked surface. This finish is often seen on Georgian and Victorian buildings, gateposts and walling. Bull set – worked with two people, this waste-removal method comprises a large wedge-shaped hammer on a long handle. Using the long handle, one stone-cutter would set the wedge of the hammer tight onto the granite surface, while a second stone-cutter would strike the head of the wedged hammer with a 14lb hammer. Large blocks could be roughly shaped using this method. Chip line – a fine (white-powdered) line along the arris that marks the transition from one facet to another on masoned granite. This simple-looking finish actually requires a strictly ordered set of tooling methods and is remarkably difficult to master. Choc chisel – essentially a chasing tool, this flat 25mm chisel is used for finishing and drafting. Cocky High – the optimum height for granite banker-masoning. Most dressing of granite requires heavy punching; setting the worked surface of the granite at groin level provides optimum opportunity for downward hammer forces and efficient energy expenditure in the upper body. The rhythm or ‘beat’ of the mason’s hammer action, which takes several years to attain, is also critical to efficient banker masonry, and ultimately to the economic success of the quarry. 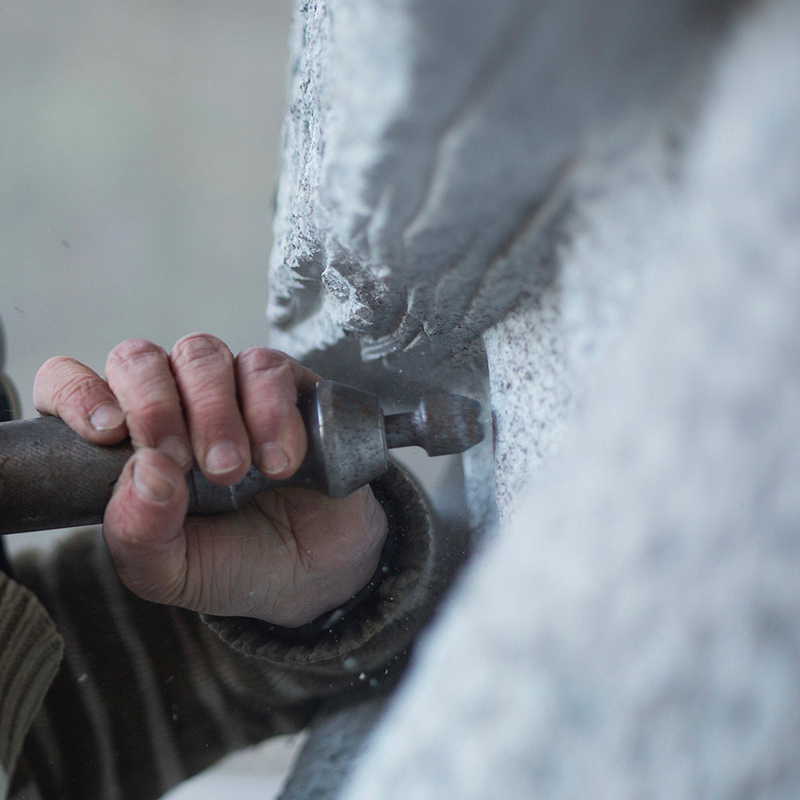 Dolly – a pneumatic version of the traditional ‘Bouchard hammer’, this multi-pointed tool, which slots into a pneumatic chisel-gun, removes surface waste and provides a stippled texture to the granite. Fine axe – featured on finely worked masonry and headstones, this finish displays regular vertical lines etched across the surface, created with either a ‘patent (multi-bladed) axe’ or a pneumatic flat chisel. Very fine examples of this finish can be seen on the interior Merrivale granite masonry of Castle Drogo in Devon. Lamb’s leg – a greyish, mottled streak of elvan running through the granite matrix. This feature is not desirable as the change in hardness — elvan is usually much harder and brittle — makes working more difficult, and the visual aspect is also frowned upon. Out-of-wynde – ‘wynde’ refers to the uneven surface of a rough block, and getting it ‘out-of-wynde’ involves a set of (usually) four wynding blocks set on each corner. A straight edge is laid on a pair of wynding blocks at each of two ends, and eyed up for level. This way, each corner is set at the same level, which then provides the reference points for the draft line to be cut-in – all the way around the granite block. The middle is then dressed using a hammer and punch to remove the waste, with the aim of finishing the surface to the specification required. Pitch tool – a large and wide flat chisel predominantly used for removing large chunks, or in situations in which a sufficiently flat surface, with a free end, can be worked. Plugs and feathers – made from forged–iron comprising a plug (long tapered wedge) with two feathers (oppositely tapered to the plug and with curved heads) that are placed in the holes of a ‘stitch split’. Each of the plugs is then struck with a hammer – from first to last, and then from first to last again. The gradual build-up of pressure, as the plug tightens between the feathers, is registered through the rising pitch of the struck metal. A crack will slowly grow between the holes and travel down through the granite, and sometimes it can be best to let the split rest or ‘arc’ — time for a cup of tea — before continuing. When the split becomes very noticeable, the pitch of the hammer strike will suddenly dull as the pressure eases. Punch or point tool – a pointed chisel used for waste removal and finishing. Chisels used for everyday work at Trenoweth have a tungsten insert, but for very hard granites – such as Trenoweth’s own Buckle and Twist – the traditional forge-tempered chisels remain the most effective. The forged chisels would be tuned to the mason and his particular granite – the harder the mason hits, the softer the tempering on the chisel. Ridder – a term that has only recently come to light, a ridder would be a quarry-worker who would take away the chippings and waste from the banker masons’ working-area. Rough/medium/fine grain – all the granites of the South West vary in grain size, sometimes changing even within the same quarry. The grain is partly determined by how quickly or slowly the magmatic granite cools — as a generalisation, the slower the cooling the larger the crystals. The feldspars are often the most visible crystal formation in the granite, some being palm-sized like the Blackenstone granite from Dartmoor. And as with the granites exposed on Sennen beach in the far south west of Cornwall, the flow of the molten granite is evidenced by the direction of the finger-shaped feldspars. Rough/medium/fine punch – this process refers to the way in which a punched finish would be applied, and is determined by how deep, hard and how many impact marks there are per square foot. Finer finishes, such as ‘fine axe’ (fine chisel marks) can be applied over the punch marks. Shoddie – off-cut or waste granite that is reused as a building stone. The waste granite is cropped, using a pneumatic press, to provide a rough outer face. Then the masons have to square-up each shoddie using a pitch tool. Stitch-split – in this method, used in the granite industry of the South West after the 1800s, a line of holes is drilled into the granite, which are then stopped with plugs and feathers, allowing the banksmen/stone-cutters to split the granite into slabs and shapes. Swell jumper – a one to two metre forged-iron tapered pole, with a large flange in the middle and fish-tailed ends used for drilling holes. This tool formed part of the technological advancements during the 1800s that replaced the ‘wedge and groove’ method for splitting granite. Quarries now use very powerful and violent pneumatic drills for large and small-scale splitting. 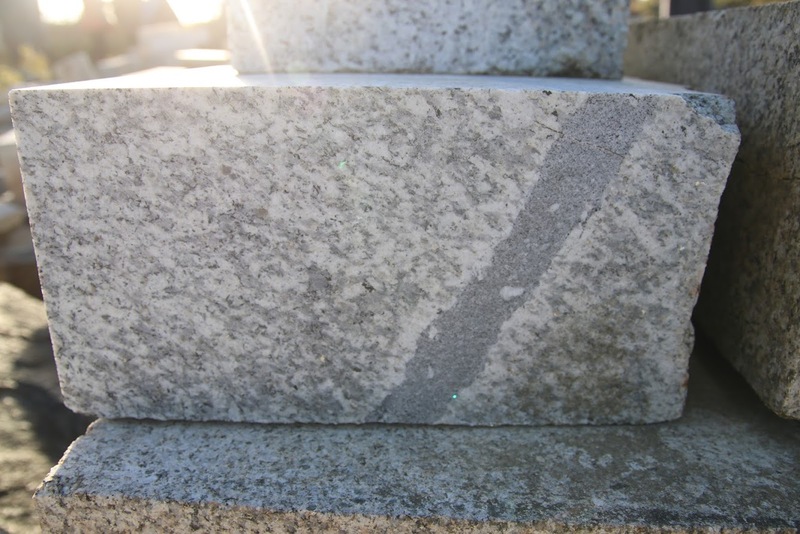 Tough way/second way/grain way – granite has a three axial orientation, and as one looks at a quarried face, one often sees the vertical tough way jointing. Grain (or cleeving) way lies on the horizontal bed, with second way on the face. Grain way is the most forgiving plane to both dress and split. The banksmen splitting granite down in the quarry would, as much as possible, split along grain way for the final part of the reduction process, as there was a greater guarantee of a clean and straight split. A cleaner and more precise split will mean less work for the mason or carver. Text © David Paton and CAST (Cornubian Arts & Science Trust), 2018. Dr David Paton has been carving stone for twenty-five years, working exclusively in the last ten years with south west granites. He has a practice-based PhD in Cultural Geography from the University of Exeter. In his Brief Geology of Granite, David refers to, or draws on, a number of texts: Peter Stanier’s comprehensive and beautifully practical South West Granite (1999) provides much of the finer detail. The field trip members were: Steven Claydon, Celine Davies, Rose Ferraby, Hazel Gibson, Rachael Jones, Patrick Langley, Tim Martindale, Eileen McCormack, Beth Pinner, Ruth Siddall, Beth Simons, Rob Smith, Nicola Thomas and Amanda Wood. The field trip Tracing Granite: In Search of a White Cross took place from 4 to 8 October 2017 and was organised by David Paton with support from the Groundwork team. The field trip was funded by Feast with advice from Rose Barnecut. Bunk house accommodation was provided by National Trust South West, arranged by Ian Marsh, the Trust’s Area Manager. Lisa Mortensen arranged for the loan of a minibus from Cornwall College and a member of staff, Amanda Wood, to drive it. Chris Morris, Director of the School of Film and Television at Falmouth University, provided a budget for Rachael Jones to make a film of the event. Ernie Hillson, Geoffrey Giles, James Strongman, Barry Taylor, Clive Tomkins, Christine van Leeuwen and Peter Randall-Page contributed stories and knowledge at the quarry sites.